See...I have been busy! 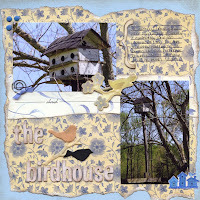 I also have layouts for the Crate Paper Manufacturer Kit at Crop Addict, the May I Deserve It All Kit from Serendipity Scrapbooks, and the challenges I did this weekend at www.scrapbooks.com for National Scrapbooking Day to show you. I'll spread those out for the next several days. I'll also have instructions for some of them. 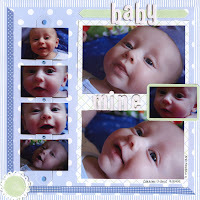 I've also done a couple of tutorials for Crop Addict and Serendipity. 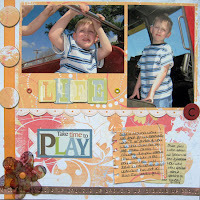 On Serendipity, you can find a tutorial for the Cracked Glass technique under the Totally Techinque forum and under Stampers Pad you can find a technique to add dimension to your stamped images. 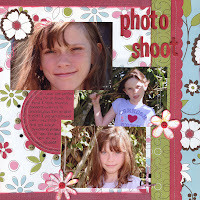 For Crop Addict, I did a tutorial on Using a Photo as a Background and one on Scanning and Stitching your Layouts using Photoshop Elements (there's directions on how to size them for posting to online galleries too). Crop Addict April Kit [patterned paper: American Crafts (a la Carte: Romaine, Pumpernickel, Cinnamon, Artichoke); ribbon: May Arts]; journaling block template made from label from Jenni Bowlin packaging; marker (EK Success: Zig Writer); foam adhesive: The Paper Studio; cardstock: Stampin' Up! 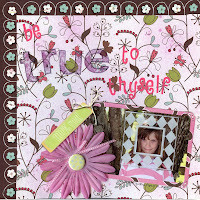 ; die cut words: Cricut; software: Cricut Design Studio; flowers: Maya Road; ink: SU! ; brads: The Paper Studio; felt flowers: SU! 62 Years (This one was done for my Tea Staining Challenge at Serendipity for our Mad Hatter's Tea Party Crop a couple of weekends ago). cardstock: Bazzill (Starmist), SU! (vanilla); patterned paper: K&Company; stamp wheel, ink: SU! ; color pencils, blending pencil: Prismacolor; die cut: K&Company; distress ink: Ranger; chipboard letters: American Crafts (Thickers: Remarks); felt birds: Maya Road; journaling stamp: Inque Boutique; chipboard bracket: Bo Bunny; brads: Close to my Heart; journaling pen: American Crafts (Precision); metal clip: Paper Studio; ribbon: SU! 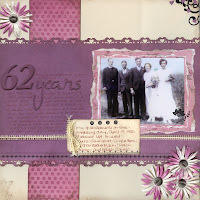 Crop Addict March Kit [patterned paper: We R Memory Keepers (Promenade: Dreams, Pinwheel); chipboard circle: Heidi Swapp (Crimson); large eyelets: We R Memory Keepers (Racy Red); brad: Bazzill (apricot)] Crop Addict Add-on Kit [chipboard stickers: We R Memory Keepers (Layered Chipboard Promenade: Words)]; Crop Addict Feb Kit [cardstock stickers: Cloud 9 (Sorbet Villa: Borders, Little Big Word Stickers)]; rub-ons: Making Memories (Destination); marker: SU! 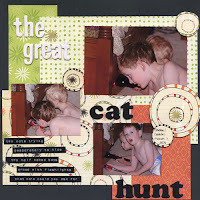 (to finish edge of red circle); template: Fiskars; marker: EK Success (Zig Writer: wheat); journaling stamp, ink: SU! ; small corner rounder: SU! ; notebook punch: SU! ; metal tape: Karen Foster Designs; metal embossing kit: Making Memories; self-adhesive ribbon: Die Cuts with a View (orange); chipboard: SU! 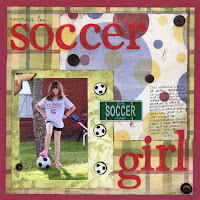 ; journaling spot: Heidi Swapp (Ledger 1); transparency: Hammermill; alcohol ink, blending solution: Ranger; die-cut: Sizzix; staples; photo corner punch: SU! You've been very busy, theu are all amazing Kim. 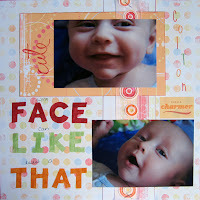 great pages Kim, just love seeing what you come up with!!! !